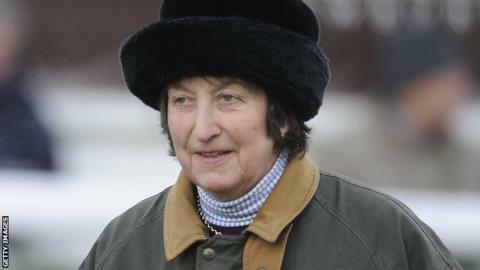 Trainer Henrietta Knight will make her return to racing in Bangor on Friday with Calgary Bay. Knight, 68, who guided Best Mate to three Cheltenham Gold Cup wins, retired in 2012 because of her late husband Terry Biddlecombe's ill health. But Knight can saddle horses in hunter chases and will send the 12-year-old off in the 4.50 at the course where she had her first ever winner back in 1989. "We're both making a comeback," Knight told BBC Radio Oxford. "Calgary Bay's been with us since he was two and a half so he's part of the furniture. "He hasn't raced for two years because of injuries and he would love to run him in the Foxhunters' Steeplechase at Aintree on 9 April. If he qualifies for that, then he'll be retired afterwards." Races classified as hunter chases allow amateur and licensed trainers to enter horses at National Hunt courses, with amateur jockeys in the saddle. Knight's successes with Best Mate and Edredon Bleu made her one of the sport's top trainers and she enjoyed more than 700 winners in her career, starting with The Grey Gunner at Bangor in 1989. She formed a formidable training partnership with former champion jockey Biddlecombe, who died last year. "I haven't really missed it because I used to do it with my husband and when he died it would never have been the same without him," added Knight, who is based at West Lockinge near Wantage. "We did everything together for 20 years and it would have been painful to do it without him because he was a huge help to me and he knew so much about racing. "But it's nice to dip my toe in the water and see my friends. I keep in touch with a lot of jockeys and owners but it's nice to be back with some form of responsibility. The Bangor meeting could yet fall victim to cold weather, but Knight said that if the meeting was called off the intention was to find another race for Calgary Bay - a former Grand National horse - as soon as possible.